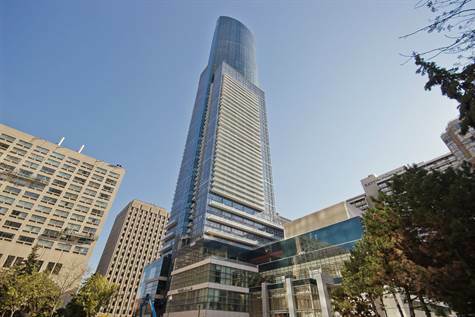 Toronto Real Estate Blog - GTA News : Stunning Luxury Condo For Sale at in Toronto- Yonge/Gerrard! 2 Bedroom +Den, Spa-Like Washrooms and Stunning Views! Perfection! Stunning Luxury Condo For Sale at in Toronto- Yonge/Gerrard! 2 Bedroom +Den, Spa-Like Washrooms and Stunning Views! Perfection! Luxury Suite! 1297 Square Feet! • 2 bath, 2 bdrm apartment - MLS® $1,199,000 - Exclusive Listing! Yonge/Gerrard, Toronto - Aura Condo Assignment For Sale at Bay Corridor - An EXCLUSIVE – Not on MLS! 2 bedrooms + generously sized den, 2 full spa-like bathrooms with soaring 10 foot ceiling height, 8 foot doors and upgraded baseboards, trim & light fixtures! Unobstructed south view from the 60th floor . Fantastic open concept layout with spacious living & dining rooms. Gourmet kitchen with quartz counters, huge island and pantry. Upgraded GE stainless steel appliances including double-door refrigerator & wine fridge. Both Bedrooms with walk in closets. 1 Parking spot and 1 Locker located on the same floor as suite - super value! Did we mention the views? They are spectacular! A true bird’s eye view of Toronto’s magnificent skyline, including the CN Tower and Lake Ontario. The location can’t be beat – Aura is in the heart of downtown Toronto at the corner of Yonge St and Gerrard St; adjacent to College Park which is some of the finest retail shops in the core. No need to leave the building to access Marshalls, Bed Bath & Beyond and more! Direct access to the PATH, subway, great restaurants and more. PLUS residents have access to Madonna’s gym, Hard Candy Fitness! Steps to Ryerson University, University of Toronto, Toronto General Hospital, Sick Kids Hospital, Princess Margaret & more. This is truly the most central location in the city. Aura’s beautiful & modern glass building will impress you as you walk in with beautiful artwork, marble & stone, 2-storey lobby with 24/hr concierge. Enjoy world class amenities & state of the art facilities. It’s the only condo building with it’s own 3 acre park – a perfect home for executives, families – this lifestyle suits all. This is downtown Toronto living at it’s best! Aura condo assignment for sale. Do You Have a Brand New Condo coming up for closing -- Would You like to Sell Before You Close with the Builder. Call Our Condo Department Today for more information on Assignment Condo Sales in Toronto.